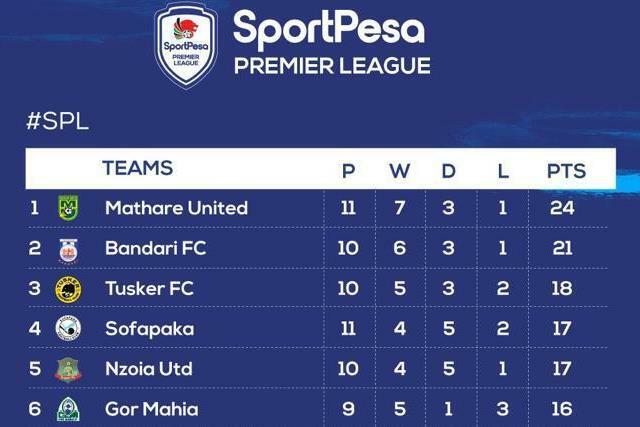 Sofapaka moved to fourth on the Kenyan Premier League table after beating Kariobangi Sharks 2-0 in Machakos on Sunday. Goals in either half from Cliff Kasuti and Umaru Kasumba saw Batoto ba Mungu break Sharks’ unbeaten run and pick their third win in four games. The victory took Sofapaka to 17 points, seven behind leaders Mathare United and one behind third placed Tusker FC. Sofapaka started the Sunday afternoon tie positively, attacking from the first minute, but the team was forced to reshuffle the team just 12 minutes into the game after skipper Dennis Odhiambo limped off after a collision with Sharks’ midfielder James Mazembe forced him out injured. Elli Asieche came in to replace him. Sofapaka had three early chances with John Avire’s shot from a freekick going wide while Kasuti saw his shot from inside the box saved by Sharks keeper John Oyemba. In the 22nd minute, Titus Achesa forced the Sharks keeper to a great save with a well curled freekick from the edge of the area. The team finally found the lead in the 27th minute when Kasuti tapped the ball home from close range after Oyemba spilled a corner taken by Asieche. Batoto ba Mungu continued their dominance and two minutes to the break, there was another chance when Mohammed Kilume’s dipped ball from range found Kasumba, but the Ugandan could not have the ball on target despite volleying it over the keeper. In added time, Sharks almost drew level, but Faina Jacobs raced back to make a decisive tackle to pick the ball off Sydney Lokale as he prepared to have a go at goal from a counter attack. In the second half, Sharks were stronger and they almost drew level three minutes in when Justin Ndikumana spilled a cross from the right but Lokale failed to hit the target under pressure from Moussa Omar. Quarter of an hour before full time, Sharks came close but defender Omar made a brilliant block, throwing himself on the way as Eric Kapaito pulled the trigger at the backpost. With the clock ticking, coach John Baraza threw in defender Soter Kayumba for Brian Magonya in a bid to tighten up the defense. However, Kasumba ensured the nerves were settled when he scored in added time off an Ibrahim Kajjuba cross in a move initiated by Kayumba.